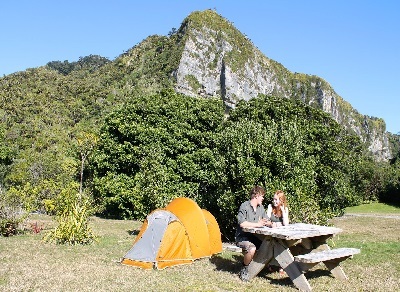 Powered and non-powered sites at the Punakaiki Beach Camp are surrounded by native bush and have incredible views of the impressive limestone cliffs which look down on the camp. With less than a minutes walk down to the beach camping at the Punakaiki Beach Camp is really like staying in paradise. All sites include hot showers and use of kitchen facilities. NO DOGS at the camp between 1 October and 1 May, then strict guidelines outside these times. Punakaiki Beach Camp has 30 powered sites available. Powered sites are spacious and very scenic, there is plenty of room to set up your camp chairs and relax in the setting sun. Dump station facilities are available for guests use. All sites include hot showers and use of kitchen facilities. Non-powered sites allow for more choice on where to camp. Either next to the beach, surrounded by native bush or closer to the facilities for the kids. 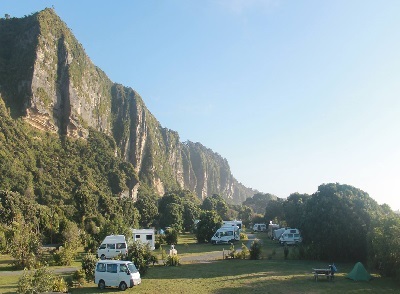 The Punakaiki Beach Camp offers many choices for non-powered sites. All sites include hot showers and use of kitchen facilities. During the summer we can be very busy sometimes, to secure your place hit the 'BOOK NOW' button below to be directed to our online booking sytem or contact us on the details at the bottom of the page.